1. Convertibles cost considerably more to rent than compact and midsize cars. For example, I just searched Expedia.com and compared the rates. The daily rate for a convertible car was $52 while the rate for a mid-sized car cost $37. The daily rate for a Jeep Wrangler was a whopping $90! Just one more word on roaches – I am a big chicken when it comes to bugs. I know that in a tropical environment like Hawaii’s has, there are bound to be roaches. I have never let this stop me from returning to a place I love so much. 3. We found that we didn’t have the top down nearly as much as we anticipated. Sometimes we were happy to have the top up and the air conditioning on to escape the hot sun. Bear in mind, too, that sometimes a rain shower can sneak up on you with little warning. 5. There is very little room to store luggage in a Jeep Wrangler. In fact, Jeep Wranglers barely have enough room for one carry-on or two. I like to travel light but not that light. 6. Renting a 4WD is a big waste of money. Why? Any off-roading is considered a violation of most rental contracts. Pick up the maps that the rental car companies offer. Turn to the page that shows the entire island. Take note of the areas usually marked in red. Look at the notes. Yep, it tells you where you can’t drive. Even some paved roads are forbidden. So, save your money and just rent a regular 2WD car. I didn’t write this article to scare you. In fact, I hesitated on writing this article, but I eventually decided that it was important to share it with you. The information I’ve shared is something that I would have wanted to know before I selected a rental car for my first few trips to Hawaii. I think it’s important for you to know all the factors to consider before you commit to a convertible or Jeep. Again, I enjoyed some aspects of my soft top rentals, but knowing what I know now, I doubt I’ll ever rent one again. I agree about not using it as much as we thought we would. I drive a hard top convertible here at home and I rarely have the top down since it’s so darn hot! We did rent one in Maui, (fortunately it was bug free) and we really enjoyed the Road to Hana in it. Other than that, I could have done without a convertible. Lissete – a convertible for the Road to Hana is ideal, particularly in the summer months when Maui doesn’t get much rain. It’s such a beautiful drive and it’s nice to get to hear the waterfalls and smell the tropical air with the top down. Thanks for sharing your experience. I’m glad your convertible was bug free! Hi Emma – yes, there’s definitely give and take as you pointed out. Since I’ve tried both convertible cars and Jeeps, I’ve got that worked out of my system. We now choose a compact car (one bigger than the economy car and the one smaller than the mid-sized car). A compact cars get good gas mileage, they’re relatively cheap, and they’re easier to park in tight spaces. just stumbled upon your website, really enjoy it. Congratulations Sheila, I see your post was quoted in the LA Times travel blog. As for convertibles, we liked the last one we rented in Maui so much we bought one. As for the jeeps, keep them, they’re to impractical. Jeeps really are impractical and expensive. They’re definitely not worth it. Usually I don’t leave comments about a negative Hawaii experience, but it was the topic of your post and I was staying on topic! I think a jeep is great when you need it (like when you were on Lanai), and can leave your stuff at the hotel. HVG – Yes, your comment was very much on topic! People should be aware of the fact that a soft top Jeep makes them more vulnerable to theft. I think it’s easy to let your guard down on vacation, so people need to know that they do need to be careful about protecting their valuables. The first time we went to Maui, it was with friends. We rented a Jeep Wrangler. The day we drove the road to Hana, we had the soft top roof down. We had stopped at the Hana Hotel for lunch and I had bought a nice book on Gary Reed paintings from the gift shop there. Later we stopped at the black sand beach and I didn’t want to bring the book with me. I tucked it in the small cargo area behind the back seat. I was nervous that it might not be there when I got back, but it was. I think I was lucky in that situation. – So my point here is that there’s not always a thief hiding behind every corner, but a Jeep makes you more vulnerable. I know what you mean about not making it a habit of leaving negative comments about Hawaii. Hawaii has so many wonderful things that it is even rare to find something negative to say. When I have something to write about (like this post) I really do struggle over writing it, but what helps me decide on if I should write it or not is that I ask myself, “Would I have wanted to know this when I was planning my trip to Hawaii?” If I say yes, I write about it. It’s still hard though. On my last trip we rented a jeep for 1 day for a drive to Pali Outlook and around the island… it was perfect for a day we didn’t need to bring a bunch of stuff with us and didn’t need to leave anything in the car, and didn’t need it overnight. We found that we didn’t even need a car our other 8 days in Waikiki anyway, taxis, the bus, and our feet were fine. The day we needed it we rented from a desk at our hotel lobby and I think it was only $50. My wife and I have decided to rent a convertible for our stay in Laie for 265 for 8 days. I think it will be cool. Get a Miata when you’re in Hawaii, pure bliss. What rental car company was the car with the roaches?? Are some rental car companies less bug infested than others? Was is a no-name rental car company? I don’t recall, but it wasn’t a no-name. We’ve had bad luck with Dollar Rental Car. We tend to have good luck with Avis. 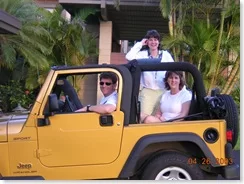 Hi, Many years ago, I had rented beat up wranglers on Maui and Lanai. They had no tops at all, transmission problems, and every panel dented as if they had been rolled over on multiple occasions. They were the MOST fun rentals I had ever had as there was no worries about dents, scratches, or no-go areas. The transmission in the Jeep I rented in Maui seized in 2nd gear. I returned it expecting a problem and the owner/worker said in the most relaxed Hawaiian way, “Probably needs fluid, there’s 5 out front with the keys in them, take the one you want”. Does anyone know of a similar rental place on the Big Island? I don’t know of a used car rental place on the Big Island but I used a peer-to-peer rental site (Turo) to rent a 4 door Jeep. We made sure it had the equipment we needed and that the owner was okay with our itinerary and used ours to explore several 4WD only roads and tracks. Of course, if we had run into trouble, we would have been responsible for getting ourselves out and for most repairs. On the other hand, 4WD isn’t needed or helpful on most Big Island roads and there are folks who will take you up Mauna Kea, down into Waipio, to the green sand beach, etc. for a reasonable fee.